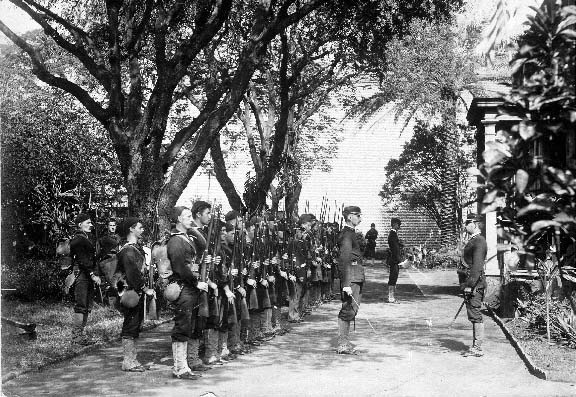 Disappeared News: Coup d'état in Hawaii: Queen deposed on 17 January 1893, relinquished her throne to "the superior military forces of the United States"
Coup d'état in Hawaii: Queen deposed on 17 January 1893, relinquished her throne to "the superior military forces of the United States"
Today is the day in history that the lawful government of Hawaii was forcibly removed in a coup d'état by a group of businessmen and sugar planters with the direct assistance of the US military. Queen Liliuokalani was forced to abdicate. I Liliuokalani, by the Grace of God and under the Constitution of the Hawaiian Kingdom, Queen, do hereby solemnly protest against any and all acts done against myself and the Constitutional Government of the Hawaiian Kingdom by certain persons claiming to have established a Provisional Government of and for this Kingdom. "That I yield to the superior force of the United States of America whose Minister Plenipotentiary, His Excellency John L. Stevens, has caused United States troops to be landed a Honolulu and declared that he would support the Provisional Government." Now to avoid any collision of armed forces, and perhaps the loss of life, I do this under protest and impelled by said force yield my authority until such time as the Government of the United States shall, upon facts being presented to it, undo the action of its representatives and reinstate me in the authority which I claim as the Constitutional Sovereign of the Hawaiian Islands. On 14 January 1893, a group composed of Americans and Europeans formed a Committee of Safety seeking to overthrow the Hawaiian Kingdom, depose the Queen, and seek annexation to the United States. As the coup d'état was unfolding on 17 January the Committee of Safety expressed concern for the safety and property of American citizens. In response, United States Government Minister John L. Stevens summoned a company of U.S. Marines from the USS Boston and two companies of U.S. Navy sailors to take up positions at the U.S. Legation, Consulate, and Arion Hall. On the afternoon of 16 January 1893, 162 sailors and Marines aboard the USS Boston in Honolulu Harbor came ashore under orders of neutrality. Historian William Russ has noted that the presence of these troops, ostensibly to enforce neutrality and prevent violence, effectively made it impossible for the monarchy to protect itself. 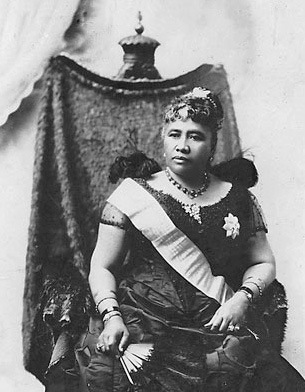 The Queen was deposed on 17 January 1893 and temporarily relinquished her throne to "the superior military forces of the United States".She had hoped the United States, like Great Britain earlier in Hawaiian history, would restore Hawaii's sovereignty to the rightful holder. US troops from the USS Boston invade Hawaii (state archive photo). Probably the ship and the landing of troops could be seen by the Queen from the upstairs windows of the Iolani Palace, since the harbor was closer than it is today. More photos and description at Overthrow of the Hawaiian Monarchy.